Opening the fountain "Agurniy" in Podolsk. October 5, 2014 - the Day of the city of Podolsk. 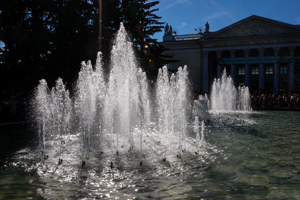 In this day on the pedestrian zone of Kirov Street, was took part the opening of the Fountain "Agurniy". That type of fountain makes one and only this exquisite combination of the sculpture "The first ball of Natasha Rostova" and engine of the fountain - beautiful jets framing dance for heroes of the novel "War and Peace". Fountain for the 60th anniversary of Sireneviy Sad. On October 2, 2014 in Sireneviy Sad, which is situated in Izmaylovo, at North-East district of Moscow, an amusement fountain, created by Borond Group of Companies, was open. 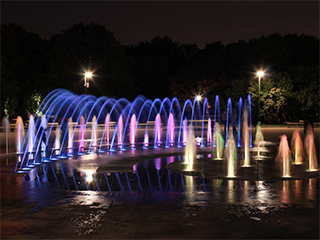 It is based on the technology of the "Beautiful City" fountain series . The opening of the fountain and the recomposition of the park area were timed to the 60th anniversary of the Garden. The opening ceremony was attended by Moscow Mayor Sergei Sobyanin. "PALATKA" is listed in the Guinness Book of Records of Russia. 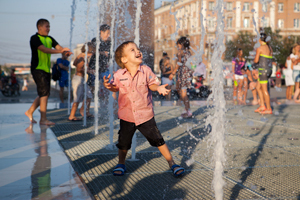 In September 2014 were the opening the fountain "AGURNIY". In the Palatka was opened four fountain, manufactured by of "Borond" Group. They are an integral part of the completely architectural design. Palatka is listed in the Guinness Book of Records of Russia, dated 09.24.14. Category: town with the largest number of fountains per capita. For 4000 inhabitants built four fountains. This is the highest rate in the country. The opening of light and music fountain complex in Sputnik. September 12, 2014 in the sity Sputnik was opened light and music fountain complex. At the opening of the complex was attended by residents and visitors that city. Their warmly congratulated the auspicious occasion a member of the Federation Council Vladimir Pedal. Opening the fountain "Cvetok" in a park of the Plavsk. 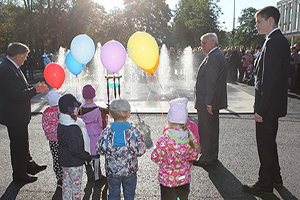 September 6, 2014 in the city park, "Imeni 40-letiya Oktiabria" in Plavsk was opened Light-Fountain "Cvetok". The initiators of the reconstruction of the park were are the city administration and locals. 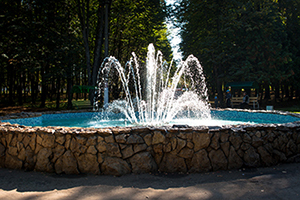 Fountain produced by Company Group "Borond" for part of the units «Krasiviy Gorod» and perfectly fits into the park. Light and music fountain "Krestiki-Noliki" was found to the 300 th anniversary of Sestroretsk. The Sestroretsk was found 300 years ago. On this date 5 September 2014 was opened light and music fountain "Krestiki-Noliki." Spechial guests who visited the opening : Acting Governor of St. Petersburg Georgy Poltavchenko, the head of the administration of the Resort District Alexei Kuimov and peoples of the Sestroretsk and visitors of this wonderful city. Opening the fountain "Morskoi Boi" in the Orsk. August 4, 2014 on Komsomolskaya Square of the sity, named Orsk was open the light and music fountain "Morskoi Boi". Opening the three fountains in Sergiev Posad. 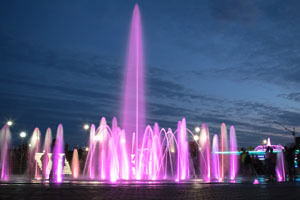 Grand opening of the city's main fountain, which is located near the Palace of Culture, named Gagarin took place 12 July 2014. On this occasion, was a city holiday "Na fone fontana." Fountain "Cascade" in the Olympic Park station in Sochi. Fountain "Cascade" has made it even more beautiful Olympic Park station. Its length is 35 meters. 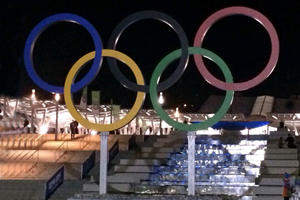 Fountain begins on the platform and ends in the main square of the Olympic Park. Water flows from a big cup and falls on the stairs and slowly drains back into the pool. Test start of a record size amusement fountain "The Star of Mordovia" was held in Saransk. The engineers and designers of Borond Group conducted a cycle of works on tuning up the basic modules of the fountain, the work on which is entered into the final phase. 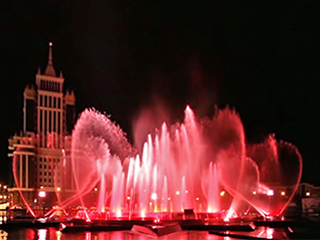 Even in the current, still incomplete form an amusement musical fountain "The Star of Mordovia" made a strong impression on all who witnessed the tuning of a program of light and musical show. Finishing of starting up and adjustment works are scheduled for the beginning of the next season.